This guide will walk you through how to set up the various channels you can use to collect feedback from your users. We’ll explain how to set them up and when you would want to use each one. If you haven’t set up your web portal and forum yet, check out this guide and do that first. Users can browse existing ideas and be exposed to multiple ideas at once. This allows you to aggregate user sentiment on each idea. Include a “Feedback” link on your website or in your app. Send out an email to your users and ask them to submit their ideas on your web portal. In your UserVoice admin console, go to Settings, then choose the “Web Portal” tab to view the options for your site. You can access your web portal at https://yoursite.uservoice.com. In-app feedback collection is effective because users do not have to leave your app to submit their ideas. This allows you to maintain a seamless, on-brand user experience. It’s designed to be frictionless and users can share feedback while it is fresh on their mind. A quick and easy way for users to submit ideas without leaving your app. 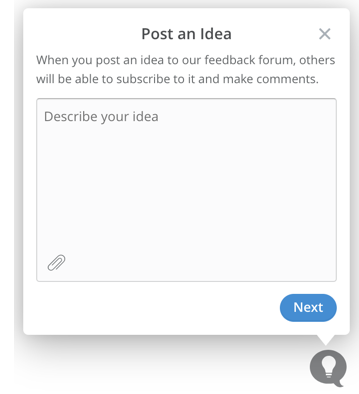 Have users submit ideas to a forum from within your app or website. To implement the Post Idea widget, you will need to add the widget code to your website. You can get the widget code from the UserVoice admin console in Settings -> Widgets. Customer-facing teams often receive valuable feedback that can help you identify product gaps and areas for improvement. Whether they receive it on the phone, in an email, or in a tweet, it’s important to make sure this feedback doesn’t get lost. By channeling this feedback into UserVoice, you also arm your internal team members with the ability to close the loop with the customer if the feedback is acted on. Identify product gaps, win more deals, unblock sales opportunities. Have your sales team capture feedback from prospects and customers. Each team member working in Salesforce will need a Contributor License to view and capture feedback with this integration (users who are full access admins in UserVoice do not need a separate Contributor license). The UserVoice admin and Salesforce admin will work together to configure the integration in both systems. 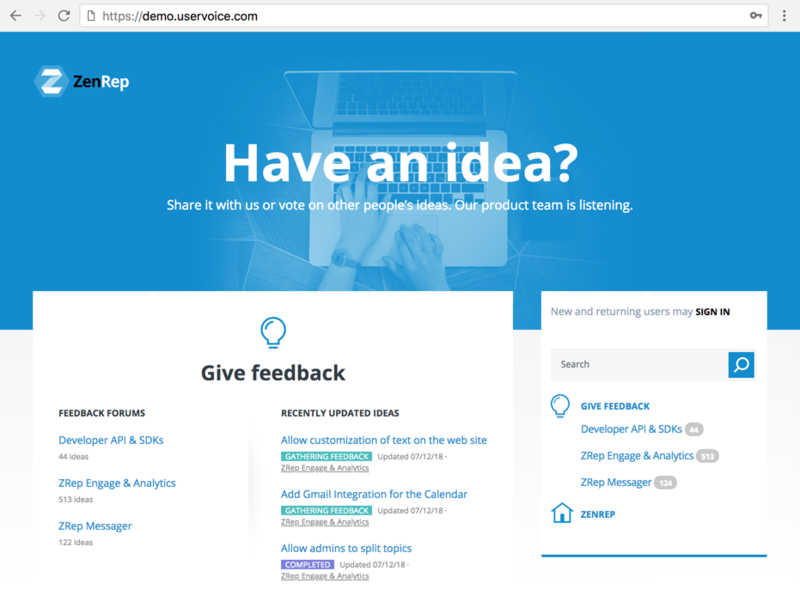 Customer-facing teams can quickly capture feedback within their browser. Contributor notifications let team members close the loop with customers when their feedback is acted on. Product managers can track the amount of feedback coming in from each team. Teams like Support, Success, and Sales can install the Sidebar and start capturing the feedback they hear from customers. If your support team uses Zendesk, we also have a Zendesk integration that offers the sidebar functionality. Each team member will need a Contributor License to view and capture feedback with this integration (users who are full access admins in UserVoice do not need a separate Contributor license). Team members can install the bookmarklet from a link found in your UserVoice settings. Collect Net Promoter Score ratings to evaluate your overall customer sentiment. Use NPS as a part of your feedback system to help you see the full picture. Auto-prompt users for an NPS rating every 60 days. Measure ratings from target customers and track changes over time. See why users gave low ratings and act on that feedback. To implement the NPS Widget, you will need to add the widget code to your website. You can get the widget code from the UserVoice admin console in Settings -> Widgets. Collecting feedback is great, but what do you do with all this feedback after you have it? 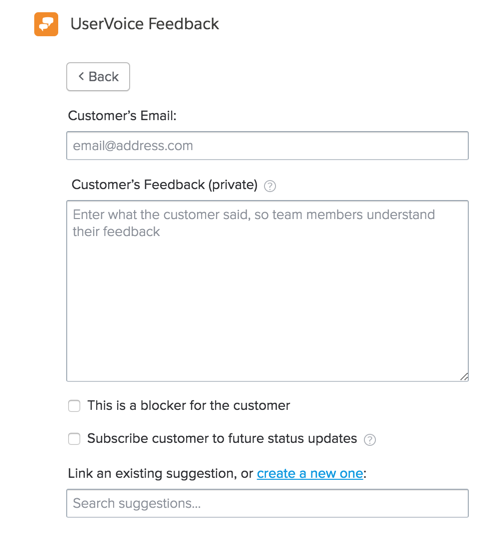 Check out our Analyzing Feedback article that walks through key features you can use in UserVoice to filter signal from noise and build your Roadmap!